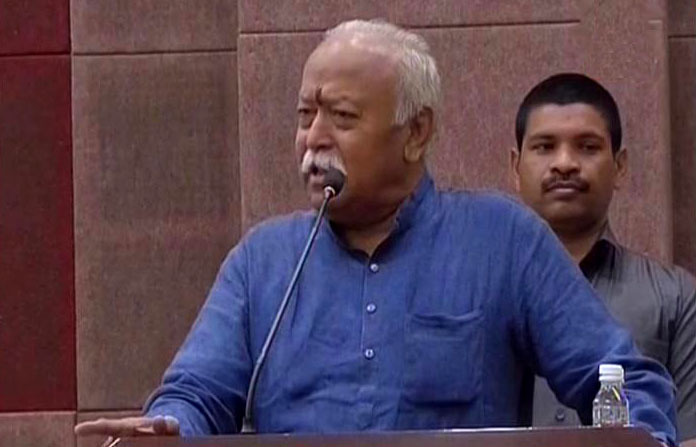 Ahmedabad: Chief of Rashtriya Swayamsevak Sangh(RSS) Dr Mohan Bhagwat is on Gujarat visit since yesterday. His visit to the state will continue till January 6. Dr Bhagwat who yesterday addressed Hindu Sammelan of Bharat Sevashram Sangh at Vansda in tribal pocket of South Gujarat today addressed a function of Sadhana Gujarati magazine at Gujarat State Cooperative Bank Ltd hall in Naranpura area of Ahmedabad. The function saw presence of union ministers Parshottam Rupala, Haribhai Chaudhary, Gujarat assembly Speaker Ramanlal Vora, MoS Shankarbhai Chaudhary, State BJP treasurer Surendra Patel, former Gujarat Chief Secretary PK Lehri among others on audience side. According to Vijaybhai Thakar(regional publicity head of RSS Gujarat), Dr Bhagwat will be attending a national level meet of RSS during 2-6 January at SGVP Gurukul in Chharodi on S.G.Highway of Ahmedabad. Mr. Thakar said, national level officials and volunteers of RSS active in various fields get togather in brainstorming meet twice every year to share their observations during tours and information received. The gathering at Chharodi Gurukul is one of such meetings. It should be mentioned here that Dr. Bhagwat has attended similar meet at the same venue in the past too.